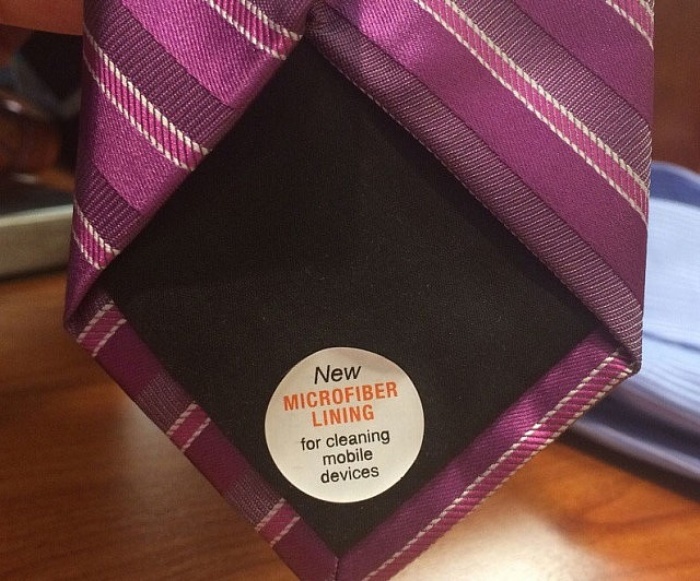 Microfiber Lined Tie: Look Dapper, Keep Your Screen Clean | OhGizmo! By Hazel Chua on 11/14/14 • Leave a comment! Wiping your phone’s screen with the back of your sleeve will clean it up a bit, but it won’t be able to give you the smudge-free screen that you want. For that, you need a microfiber cleaning cloth, but not everyone can be bothered to keep one on them at all times. But if you go to work in a suit and tie, then here’s an alternative you might want to consider: this tie that looks like a regular tie, except for the fact that it’s lined with microfiber on the other side so you can wipe your screen with it when it’s got unsightly prints and smudges. The microfiber-lined tie is available for $25.